SS: I prefer to have the light fixture centered on the table. But if you want to play with that a bit you can pick something that has multiple light sources, clustered or in a linear format, like in the Bocci 21.36 Rectangle Chandelier or the Spillray 10 Light Chandelier. 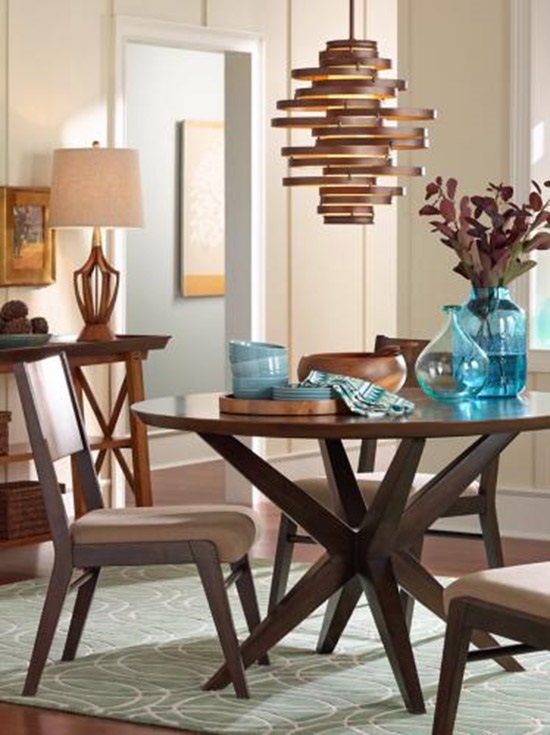 Sara Story: A dining room needs to have atmosphere and the perfect fixture and light output help achieve this goal. The light should sparkle and flatter. Usually a dining room is a smaller space with less going on than, say, a living room—fewer furnishings, often just a dining table and chairs. So a light fixture can be a central feature, like a beautiful piece of jewelry that’s also functional. 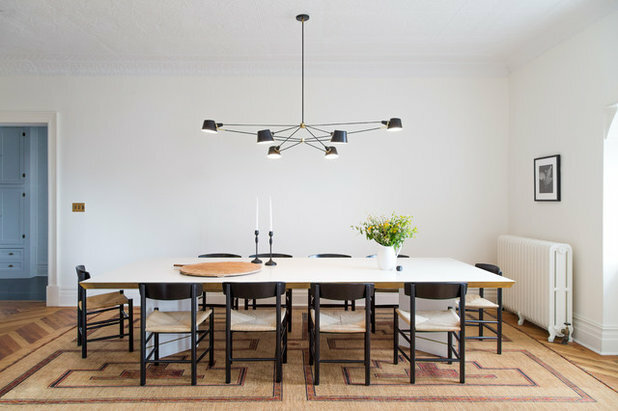 A table has to be durable, chairs have to be comfortable, but a light fixture can be more adventurous because no one’s touching it, no one’s spilling food on it. It’s the perfect opportunity to have a sculptural element that creates a mood. Designer Sara Story offers expert strategies, ideas, and product picks. They say the kitchen is the heart of the home, but for those who love lingering over meals with friends and family, the dining room shares that billing—especially during the holiday season. The right lighting fixture can make the room visually and practically, and contribute to mood and functionality. Here, New York City-based designer Sara Story, known for her elegant and eclectic interiors and a new line of graphic wallpaper, offers her tips and ideas on how best to light a dining room. SS: It’s interesting to work with scale and proportion and you can play with it depending on the look you are aiming to achieve. For a small room, I love a big fixture, like the Skygarden by Marcel Wanders. Something large-scale in a small room is whimsical and humorous, like seeing a mouse next to an elephant. I also love the Tropico Vertical Suspension Lamp fixture—its large scale is playful and unique. It evokes Polynesian or Asian traditional lighting, but in a contemporary way. 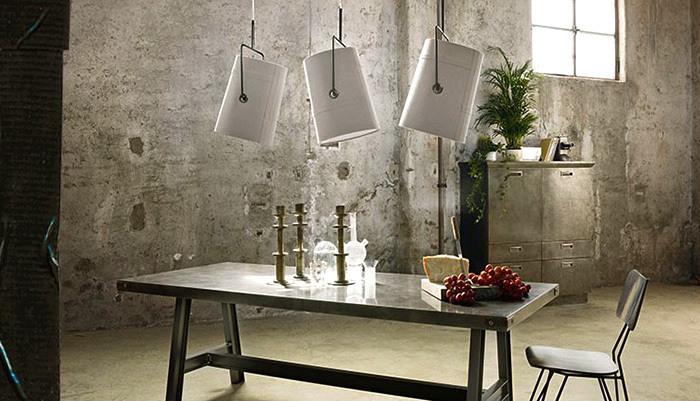 Alternatively, using a small-scaled pendant lights can be interesting, like the Alva Pendant Light. A lack of presence can be very defining, too. I’d use a mercury-tip bulb for a vintage feeling, and hang a single one over an island, or a few over a counter. 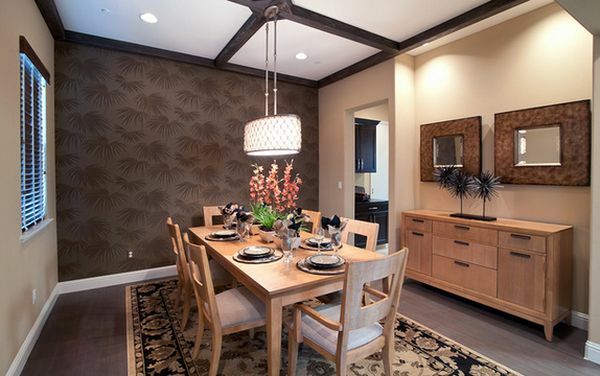 What kind of fixture do you like to hang over a long, rectangular dining table? How about over a round dining table? Is it important to center a light over a dining table? Is there another approach people should consider to light their eating area? SS: To get the best light quality on the table, a light should be installed 36 inches from the bottom of the fixture to the top of the table. That’s the standard. In a double-height room, or in cases where we want to engage with the larger architectural space, sometimes we’ll do 40 inches. SS: It all depends on the architecture and design of the space, as well as the style and form of the table. I don’t follow a rule. 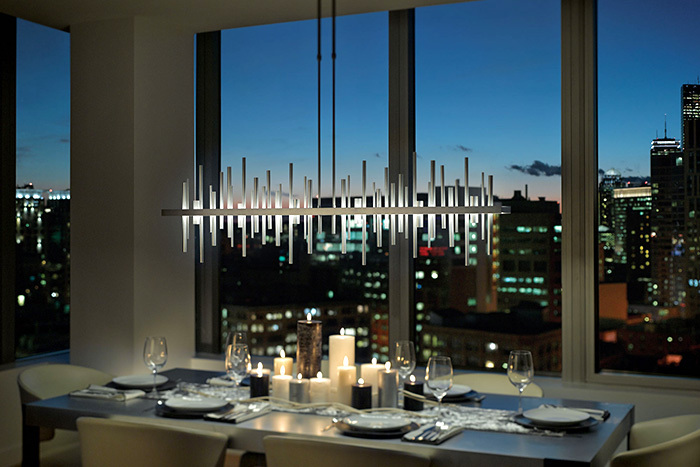 However, I like linear fixtures for rectangular tables, such as the Agnes Chandelier or Woody Endless Pendant by Roll and Hill. They are so elegant and crisp, and the proportions are perfect. I usually try to find something that’s about a third the length of the table. 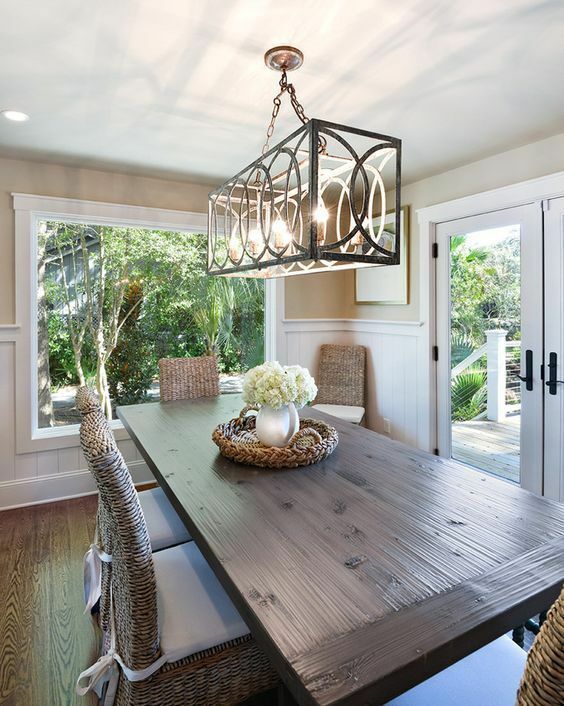 Chandeliers and pendant lights are typical go-to lights for dining rooms. Can you suggest another type of lighting someone should consider for this type of room? 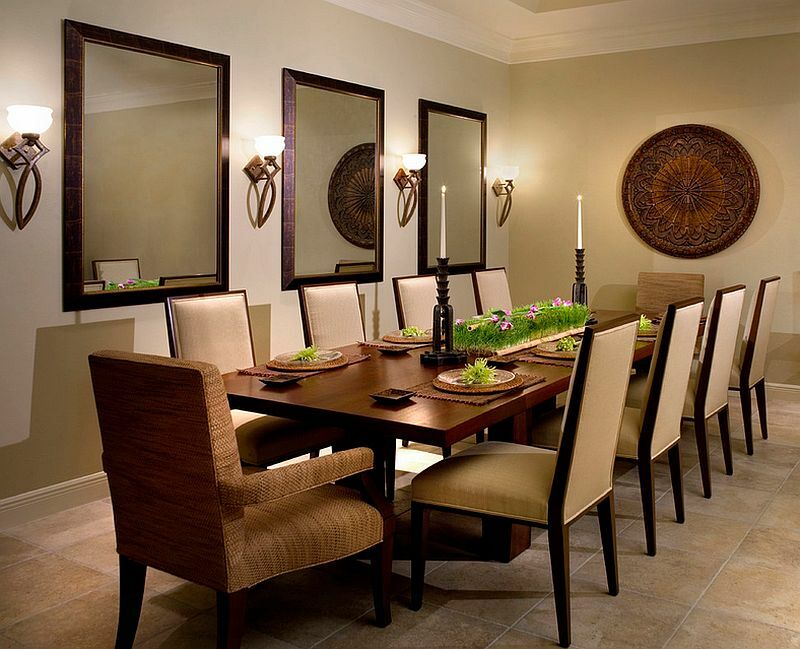 What is the best way to incorporate modern lighting in a more traditional dining room? SS: Normally I wouldn’t do a flush mount in a dining room, but if a room is boxy and the ceiling is low, the Anemone Large Flush Mount would be great, especially with a lacquered ceiling. Table lamps are nice on consoles or sideboards in dining rooms, as are decorative sconces. I also recommend light sources at different levels. 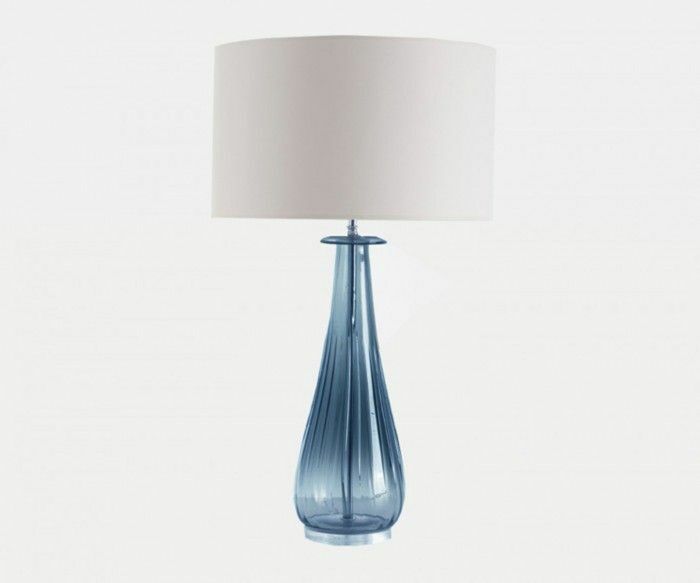 I love Roll and Hill’s Excel Table Lamp, and the Panthella Lamp would look fantastic in a traditional setting. The classic AJ Wall Light has a beautiful form and would add a great pop of color to any room. Any tips on how to pick the right size or scale of fixtures for the room? What’s important to keep in mind when lighting a dining room? SS: There are so many variables. 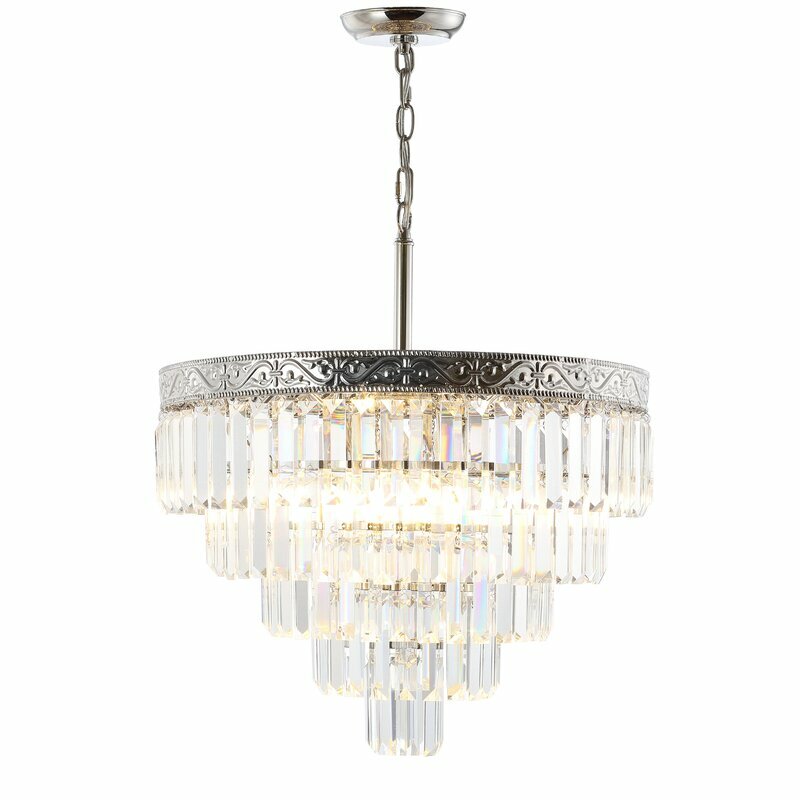 I recently had a client with a traditional and dark dining room, so I selected the Bocci 28.19 Round Pendant Chandelier to add something white and light and contemporary. If the space was more informal I might have picked the Ilde Max—the red cords make it playful and fun. Another good choice for a traditional space is the Foscarini Wave Suspension Lamp. I love how it appears to be floating in space—it has a nice lightness and a tranquil feel. Sometimes if the architecture is bold you want the fixture to be simple, to keep attention on the molding or ceiling application. That’s what you see in a lot of old traditional European buildings — contemporary fixtures in old paneled rooms make the space current. If you’ve got a small round table, a globe or round chandelier is a no-brainer, since it echoes the table shape, or I’d cluster individual pendant lights. I like odd numbers for clusters, so I’d go with one, or else a cluster of three, five, or seven.